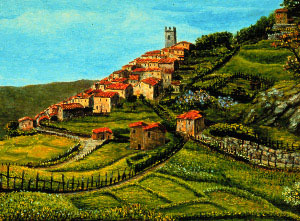 This painting shows Pontito, Franco Magnani's home town in Tuscany, Italy. Magnani, who left Italy in 1958, created this painting decades after leaving Pontito. Click on the image to see a photograph of Pontito. Try this new online exhibit-- you'll see some suprising faces. Just how do we remember a face? Pontito looks like many of the little towns in Tuscany, a hilly region of western Italy. At the upper end of the town sits the church, built a half-century before Columbus sailed for the New World. Seen from a distance, the other stone buildings seem to spill out of the church and down the hillside. The countryside surrounding the town was, only a generation ago, made up of well-tended farmlands and orchards; many of these have fallen into disarray as the agrarian economy that once supported Pontito has dwindled. I've never been to Pontito. But I've come to know the town through the paintings and drawings of Franco Magnani, a self-taught artist who lives near San Francisco. In 1958, when he was 24 years old, Magnani left Pontito. Though he did not return to Pontito until recently, nearly all of his paintings are of his native village. Franco Magnani paints the scenes of his childhood--and his works number more than 100--entirely from memory. Search only "What's New In the World"
Last Month: "The Cloning Question: Is Making Clones Making Trouble?" and "Mutant Fruit Flies Exhibit"
In the past year and half, we've explored a variety of different topics from the Amazon to whirlIgigs and a lot in between. This is "What's New's" first look at memory. The museum has been exploring this topic for a number of years and we had some great resources to work with. We hope you enjoy the online version of "The Memory Artist." The original article from which this story was adapted appeared in Exploring Magazine. "If You're Going to Rob a Bank, Wear a Wig" was adapted from the "real version" on the museum floor. If you have any comments, feel free to send us mail.